Seen in the photo above, sent in by AppleInsider reader Garrett, the Apple Summit Sierra store in Summit Reno Mall opened for business at 10 a.m. local time. 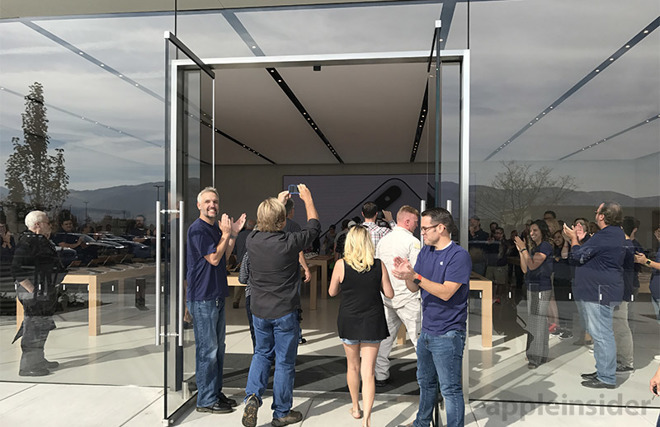 As has become tradition, employees formed a line near the store's entrance to welcome the first customers into the store, many of whom used their iPhones to film the experience. The Summit Reno Mall store replaces a smaller outlet located in the same facility. Like other recent Apple store openings, the Reno location boasts the company's "Apple store 2.0" design language, with a wide-open sales floor, custom-built wooden product display furniture and a nearly floor-to-ceiling mural-esque television display positioned opposite the front entrance. The large screen is already cycling through images and video of iPhone X, iPhone 8 and Apple Watch Series 3, all of which were unveiled at a special media event on Tuesday. At Apple's big reveal, Ahrendts took the stage to detail the company's efforts toward broadening customer shopping experiences. 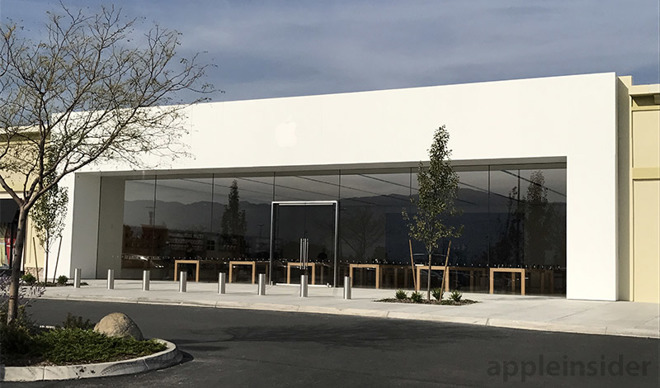 Newer stores, as well as renovated locations, feature open layouts with product "avenues," newly designed display furniture and a special area for "Today at Apple" sessions. Designed to help new and existing users take better advantage of their equipment, Today at Apple involves lessons led by "creative pros" who teach customers about music, photography, drawing and other disciplines. Indeed, instead of stores, Apple calls its retail locations "town squares," Ahrendts said, the idea being people can come in to see new products, take part in classes and connect with others. Apple Summit Sierra held a number of Today at Apple sessions on Saturday, including a photo walk featuring iPhone. Future classes include "how to" lessons for both hardware and software, basic product tutorials and Studio Hours for working on multimedia projects. The store also features Teacher Tuesdays, a special series of lessons designed to help educators leverage Apple products in the classroom. Apple Summit Sierra is open from 10:00 a.m. to 9:00 p.m. Monday through Saturday, and 11:00 a.m. to 6:00 p.m. on Sunday. The store is holding special hours from 8 a.m. to 9 p.m. on Friday, Sept. 22, to handle the iPhone 8 launch.